Family EMBERIZIDAE: Wood Warblers, Tanagers, Blackbirds, etc. Pine Grosbeaks are recorded at Cedar Creek about one out of two winters. Occasionally they are common to abundant. At Cedar Creek they feed extensively on ash seeds. Purple Finches are common spring migrants and reasonably common fall migrants at Cedar Creek. In some winters they are reasonably common at feeders near the area. Purple Finches have bred on or near the area, since adults with dependent fledglings were seen at feeders at the Vesall residence adjacent to the area along Durant in 1979 and 1980. There are also breeding season records of Purple Finches in some of the coniferous portions of Cedar Creek. Breeding on the area probably does not occur in most years. 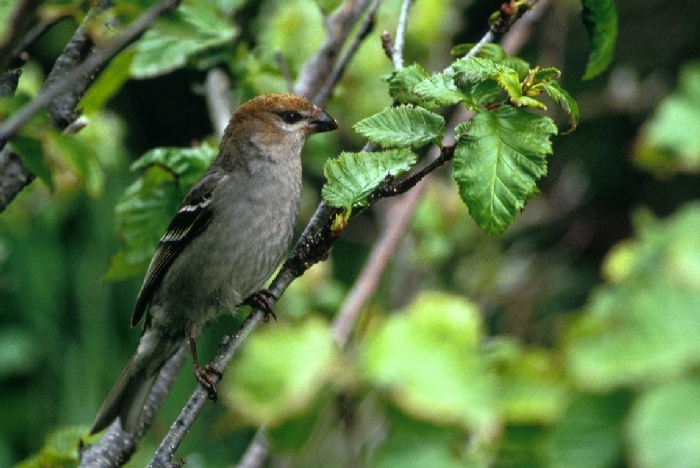 The first record of a House Finch at Cedar Creek is April 10, 1993, long after House Finches had become abundant in certain parts of the state. The birds are still uncommon in the early 1990's and there is no breeding evidence yet. 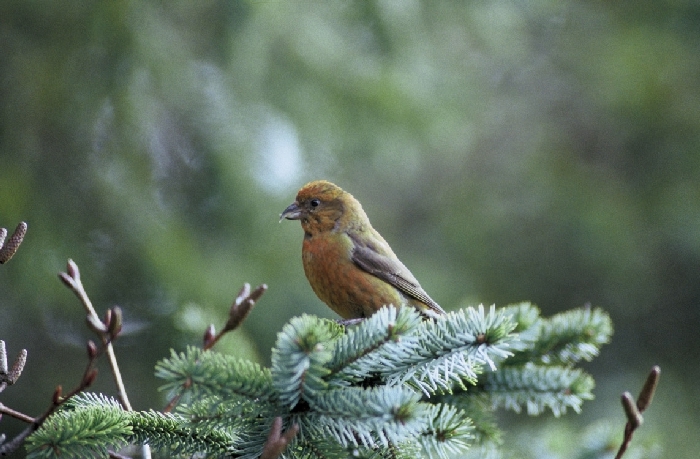 Red Crossbills are uncommon at Cedar Creek, even in the coniferous portions. Like Red Crossbills, White-winged Crossbills are uncommon at Cedar Creek, probably because of the scarcity of evergreens there. In the winters of 1988-89, 1989-90, 1990-91, 1991-92, 1994-95, and 1995-96, they were common in the Cedar Creek area, especially in the pine plantations planted in the 1930's. Common Redpoll numbers at Cedar Creek probably vary more from year to year than those of any other species. In some winters they are absent. In others they are the most abundant winter bird at Cedar Creek. In some winters they are reasonably common at Cedar Creek but rare in the Twin Cities. At Cedar Creek redpolls feed on birch seeds and "weed" seeds that extend above the snow. Numbers commonly increase throughout the winter and then the birds disappear in late March and early April. The so-called "Hoary Redpoll" (C. hornemanni) undoubtably occurs at Cedar Creek, but may just be a color morph of the Common Redpoll (Auk 102:82-96, 1985). Siskins are common migrants at Cedar Creek and are common in some winters. In other winters they are rare or absent. There are some summer records, but no positive breeding evidence. Since siskins occasionally breed in the Twin Cities, and breed farther north in Minnesota, it is likely that they will eventually be found breeding at Cedar Creek. Goldfinches are common to abundant at Cedar Creek, the year round. They breed in late summer, nesting in conifers, deciduous trees, and especially in bushes near marshes. Banding by Jean Vesall indicates that at least some of the goldfinches in the Cedar Creek area are present throughout the year. 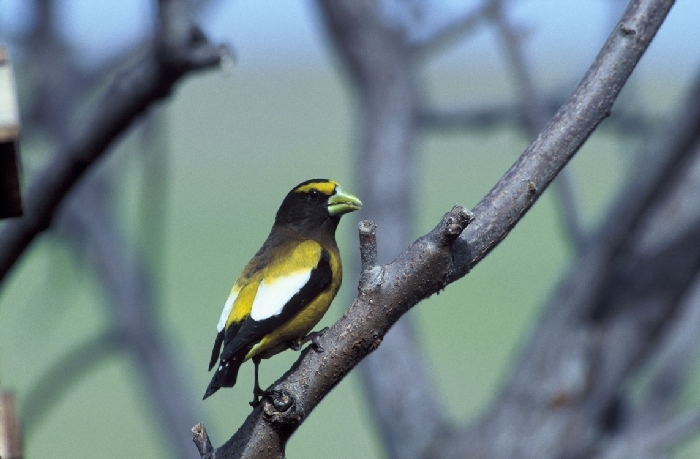 Evening Grosbeaks have been common at Cedar Creek and in adjacent areas in some winters. They are absent in other winters. Evening Grosbeak records at Cedar Creek have been declining since the 1980's. At Cedar Creek Evening Grosbeaks feed on seeds retained on the trees in winter, but also patronize bird feeders, and many apparently commute between Cedar Creek and these feeders on a regular basis. They roost at Cedar Creek in conifers and in oaks that retain leaves in winter. There are no breeding season records.